There is always a question of how much each of us is able to enjoy a piece of art or entertainment if we know the artist has nasty personal habits or less than savory political views. Where is the line where a movie stops being relevant or worth supporting, and does it go beyond subjective tastes and personal point of view? I've always argued that there is a place for controversial material. When it comes to an individual artist, if they can keep their personal politics or peccadilloes out of the material, then we should try to divorce who they are from what they've done. As a practical example, you may not know what the guy who built your house was really like. Would you move out if you found out he beats his kids? What to do then when it's something like a film by Leni Riefenstahl, who made pro-Nazi movies for Hitler's propaganda team? These films are considered important to cinema history, as well as aesthetically vivacious, regardless of their agenda. I fall on the side that, yes, we can watch The Triumph of the Will because, as a progressive culture, we understand context and our only way to understand the darkness that has influenced history is by confronting it and not sweeping it under the carpet. The same goes for D.W. Griffith's 1915 epic The Birth of a Nation, a post-Civil War story that attempts to mythologize the creation of the Ku Klux Klan. It's troubling in many ways, not the least of which is Griffith's outright racist depiction of African Americans during the Reconstruction. Yet, it's not the ideas alone that make it troubling. The fact of the matter is, I don't think The Birth of a Nation is very good. It's overlong and boring; at its best, it's average melodrama and at its worst, reckless jingoism that deifies feckless cowards hiding behind masks. The Birth of a Nation clocks in at over three hours. It is based on two novels by real-life Klansmen Thomas F. Dixon Jr., as well as the stage adaptation he wrote some time after the books were published. Griffith's version is broken into two parts. The first part goes from the days just before the Civil War through to the assassination of Lincoln. Its narrative focus is on two families, the Stonemans and the Camerons. Austin Stoneman (Ralph Lewis) is a Congressional leader living with his daughter Elsie (the great Lillian Gish) in Washington D.C. His son Phil (Elmer Clifton) knows Ben Cameron (Henry B. Walthall) from boarding school. Ben has a crush on Elsie, while Phil has a crush on Ben's older sister (Miriam Cooper). If all goes well, their families will be inextricably linked forever. Of course, in Civil War stories, one family falls on the Confederate side (the Camerons), and another with the Union (the Stonemans). During the war, they have very different experiences, with Ben Cameron reaching the rank of Colonel. He is portrayed as a hero but ends up captured. 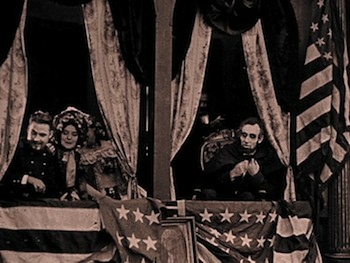 He is rescued from death when his mother, with the help of Elsie, appeals to Abraham Lincoln himself (played here by Joseph Henabary). Ben returns to find the family home and the town he grew up in both in ruins. Part 2 of Birth of a Nation is set during the Reconstruction. As Griffith paints it, the Southerners are forced to live in squalor and answer to gangs of newly militarized blacks who, along with the Northern carpetbaggers, are looking for a little payback. It's a bizarre twisting of reality, turning white Southerners into victims, a pathetic card for the losing side to play. (See also: the Republicans in the early days of the Obama administration.) Stoneman takes charge following Lincoln's death and leads the charge to establish the black man as equal. His appointee as leader of the initiative is the half-black/half-white Silas Lynch (George Siegmann), and Lynch quickly turns into the biggest bully on the block. Tellingly, Stoneman is only willing to go so far with his newfound cause. Near the end of the picture, when Lynch wants to marry Elsie, we see how much he's really for equality. Little things like that make it pretty obvious where Griffith is coming from, even without the presence of the KKK. For instance, not all the actors playing the freed slaves are really African American; some of them are white actors in blackface because no one apparently wanted black men acting alongside white women. (Inexplicably, the Camerons also have a maid that isn't just a white actor in blackface, but a man in drag!) Clearly, the filmmaker's allegiance lies with the whites. Thus, when Ben Cameron has had enough, he gets the idea to dress in a scary costume to terrorize superstitious blacks and take the South back for those who "deserve it." The first half of The Birth of a Nation is a well-made melodrama. The elaborate sets and the massive cast are still impressive to this day, and the battle scenes, many of which are shot from a long-range vantage point, present an exhilarating image of controlled chaos. It's these things that make The Birth of a Nation an important work. Griffith pioneered this kind of epic storytelling and mixed the action with the dramaturgy in a way that would influence directors that followed. The story about the rival soldiers and the romantic liaisons is nothing special. There's nothing here we haven't seen elsewhere and better realized. The only truly emotionally involving participant in the love story is Lillian Gish. She is an exceptional actress with expressive eyes. Her character walks a fine line between the two sides of the conflict, and that may endear her to us, as well. Her father is too much of a caricature to be sympathetic, even with modern eyes. And really, that's the biggest drawback of the second half of The Birth of a Nation, even if you can look past all the dirtbags in white sheets. For the Civil War scenes, Griffith rigorously researched the period and paid a strict attention to detail. This dedication was jettisoned for the back half, and The Birth of a Nation turns into an exaggerated cartoon. The black militia is portrayed as ignorant beasts with no self-control; the Northern leaders are self-important buffoons. Even the battle sequences here are not that interesting. 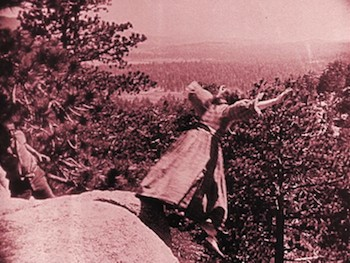 The only memorable scene is when the youngest Cameron girl (Mae Marsh) runs from an attacker and climbs a rocky butte. The size of the mountain, and more importantly, the drop from it, is made to look imposing from down below and dizzying from up above. It's then that we remember what a virtuoso filmmaker D.W. Griffith could be. While I think The Birth of a Nation still belongs in the cinematic history books, its vitality as a motion picture to be watched and enjoyed by a common audience is questionable for me. I mean, I'm a movie freak and even I find it takes incredible effort to get through the whole thing. 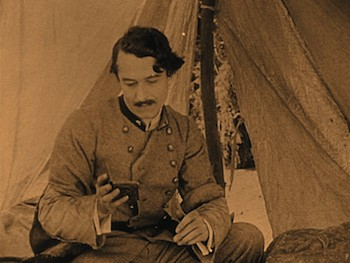 The main historical interests here are in the filmmaking technique and the noxious racial politics, which we have to assume wasn't limited to D.W. Griffith (especially considering the popularity of The Birth of a Nation in the years after its release). I'd posit that its vital for our continued growth as a country to see how deep some of these attitudes went and use them to compare how far we have (or have not) come since. In fact, I am a little disappointed in Kino's Deluxe 3-Disc Edition because it does little to give us a focal point for understanding what went into this thorny production. The anemic making-of documentary on the second disc brings up difficult topics, but doesn't really challenge all that is wrong with the historical distortions or the underlying racial themes in Griffith's "American epic." 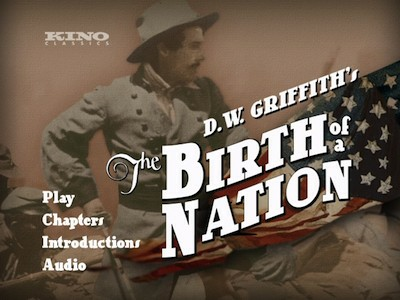 Kino gives us two transfers on their The Birth of a Nation: Deluxe 3-Disc Edition, though the main disc is the one that most people will care about. This is the one that is new to this release, remastered in HD from 35mm elements. The full-frame image, which features original Griffith title cards and also various color tints, looks excellent. There is little evidence of jumpy cuts or missing elements; the main flaws are scratches and blown out frame edges, but given the age and history of this film (the original negative degraded early on due to the number of prints that had to be made to keep up with demand), these problems are understandable. Regardless, this is the best we have seen The Birth of a Nation, and the overall digital mastering looks excellent. Resolution is sharp, and the DVD production work is fantastic. By contrast, the "1993 restoration" on the second disc shows considerably more print damage, even on just a random sampling. I am not quite sure what the logic is for even including it here. My understanding is the cut is not much different at all, and there doesn't seem much reason to compare and contrast. There are two mixes of the newly recorded audio track. The Mont Alto Motion Picture Orchestra have performed a new take on the traditional music for the film, and Kino puts it on disc as both a 5.1 Dolby track and 2.0 Stereo. The sound is fantastic, with good volume and a general clarity that gives dramatic weight to the images. For those choosing the 1993 cut on Disc 2, there is a stereo recording of the original score put together by Joseph Carl Breil. For a Deluxe 3-Disc Edition, Kino hasn't really pulled out all the stops. In fact, they've pulled out none, since the second and third discs are basically their 2002 release repurposed and repackaged. The only extra on Disc 1 are two self-congratulatory introductions featuring D.W. Griffith and Walter Huston "in conversation." These were recorded for the 1933 re-release, and there is also an alternate credits sequence from the same tour. (The "predlude" also appears on Disc 3.) On Disc 2 is the aforementioned "making of." This gives some background on Griffith's connection to the Civil War, some details about the production, and also a cursory talk about the film's reception. The most interesting thing here is the outtakes from the filming that are used to highlight how Griffith put his scenes together. Disc 3 is all supplements. There are two choices that are specific to The Birth of a Nation: "New York vs. 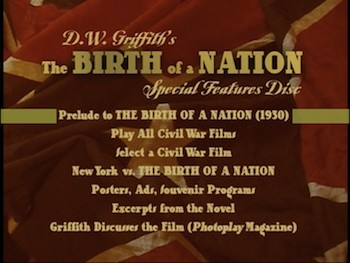 The Birth of a Nation," a short look at how the city tried to ban the film, and a gallery giving a brief glimpse at an original souvenir booklet, excerpts from the novel, and Griffith talking to Photoplay magazine. 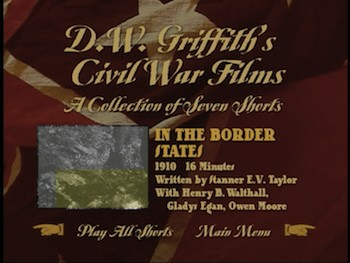 Of interest for silent film fans will be the seven Civil War-themed short films by D.W. Griffith. Made between 1910 and 1911, and ranging between 11 and 17 minutes in length, the titles are In the Border States, The House with Closed Shutters, The Fugitive, His Trust, His Trust Fulfilled, Swords and Hearts, and The Battle. The bulk of these have music by Jon C. Mirsalis, except for His Trust, which is by Robert Israel and the Biograph Quartet. These are dramatic pieces, usually focusing on men going off to war and the effects on the family left behind. The House with Closed Shutters stands out for having a somewhat macabre twist to a traditional story, and His Trust has a particularly strong combat sequence. I know when reviewing older films it can sometimes be seen as easy or lazy to take pokes at sacred cows, but all one can really do is try to approach the material as originally intended and, let's face it, sometimes that means those cows won't seem as healthy as they may have once upon a time. 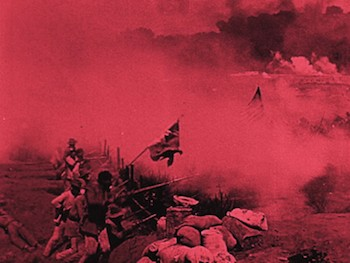 Even excepting the troubled ideology presented in The Birth of a Nation, D.W. Griffith's sprawling post-Civil War drama is a film that is more historically significant than it is dramatically vital. At over three hours, it's a conventional melodrama stretched to unbearable lengths. The battle scenes are impressive technical achievements, but the pro-KKK second half is a dud both politically and narratively. The new HD transfer is fantastic, but the overall package on this Deluxe 3-Disc Edition doesn't really up the stakes from the 2002 release. So, those dedicated to knowing cinema history should Rent It, but if I am being fair, even you guys will likely be bored.